I propose adding SMART as a payment option on Anypay. Anypay.Global is a free point-of-sale app (Android, iOS, web) designed for brick and mortar retail that allows anyone in the world to accept cryptocurrencies. It is popular in New Hampshire, Thailand, Colombia, and Nigeria. Since its inception in 2017, Anypay has steadily grown in the number of users and the amount of transactions facilitated. What makes it stand apart from the rest is its ease of use. Cashiers who know absolutely nothing about cryptocurrency can operate it safely and reliably. Adding SMART to Anypay would mean more places will accept SMART in exchange for real goods and services. I met Chris Karabats of SmartCash at the FreeCoast Fest in New Hampshire in the fall of 2018. Anypay was already in heavy use in that area at the time. He saw how well Anypay worked for Dash payments, and we got to talking about integrating SMART on our free Point of Sale app. After some back and forth talks, I recommended holding off on integration until Anypay could deliver the outstanding experience SmartCash users deserve. After honing in the on-boarding, payment monitoring, and forwarding services, we are ready to deliver the same great experience for SMART as we do for DASH and the others. Q) What unique advantages does Anypay bring to the table? A) Anypay has three major compelling advantages over other systems. First, openness. Anyone can use it. No complex forms or ID required. Second, ease of use. Your local minimum wage barista who is barely awake and barely sober can easily take payments in any cryptocurrency without any special instructions. We work closely with merchants to hone in on the most effortless and invisible way to collect payments securely and get on with the next customer. Third, we are die-hard libertarians. This is not something many companies boast, but we think it matters. We are dedicated to delivering the best possible product to the market not only because it is our business, but it is our business because we believe in building a freer society by facilitating free trade between individuals. Q) SMART is already integrated into CoinPayments and has its own POS built in. Why would we want to pay for another one? A) SMART benefits from use. The more people using it to buy real goods and services, the more value the currency has in the real world. CoinPayments is great for online use, but Anypay shines at retail. Yes, the SmartCash built-in POS might be better, but for whatever reason, merchants are a lot more likely to try Anypay than they are to try a POS specific to a coin they have never heard of. If anything, using Anypay will introduce them to SmartCash and make them a lot more willing to try the SMART POS in the future. Anypay gets SMART’s foot in the door. Q) $6000 is a lot of money for a simple integration. Why so much? A) Yes, 6000 divided by 50 hours of work means about 120 dollars per hour. And maybe it won’t even take that long, so what else do you get for your money? Well, the benefits to you accrue for years to come, and you will agree they are well in excess of the cost: SmartCash gets permanent, forever support for SMART on Anypay. That means merchants or customers with questions can contact Anypay via phone, email, or chat and get their questions answered and problems resolved quickly. It also means that SMART benefits from future integrations and developments. When future customers pay for something like the ability to do cross-currency payments (spend SMART, receive BTC for example), then SMART benefits from that without any additional cost. Plus we continually are making the experience better, easier, and more fun for merchants and users. We recently added detailed charts that reveal what is really going on in the real-world crypto economy. Finally, we are always expanding to new areas and growing the number of merchants using our platform. That means ongoing exposure for merchants to SMART and more likelihood that they will accept SMART for payment, since many of our users have a Coinomi wallet to store their coins, and adding SMART is just as easy as a few taps. We are people who love freedom and who are using our bodies, time, and talent to create a world where everyone can use cryptocurrency. Our mission this year is to grow the number of active accounts worldwide from 136 today to 1,000 by the end of 2019. SMART’s goals and Anypay’s are aligned here in that we can only achieve this goal by integrating the coins that people want to use the most — the ones with real community and people focusing on using cryptocurrency as cash in their day to day lives. For this reason, we believe SmartCash and Anypay can benefit each other, and we humbly seek the opportunity to work together with you to grow the SmartHive one business at a time. Looking forward to a productive discussion on a partnership that grows the reach and utility of SMART! Off course I would support SMART-payment in Anypay - I am even surprised the idea is not bombarded with compliments. People are asking how can you demand 7K usd for the app that only has 100 downloads on PlayMarket? Also you roadmap is questionable. Very suspicious proposal, in my opinion!!! Asking almost 800K Smarts for an app with 100+ downloads only, and a very very generic website? Any little experienced developer can make an app and a website like that in just some days, put some well known coin names listed to show some fake respect, and ask a big amount of money as if it was that important to be listed there. Come on community!!! Lets have some more respect with smart budgets. How can most people be voting YES to this project? Look to the steps of the roadmap! They are asking for fast money, with all budgets to be received in just 15 days, and with very easy steps delivered. Does it really costs $1000 to create a smart address? Like it says in the first step: “Users can set a SMART address where SMART payments will be sent”. Does it really costs $2000 to translate some messages in the screen? Like step 5: “Anypay presents Green “PAID” screen (in different native languages such as Portuguese) upon successful payment” I think the community is not looking into the projects to vote. They just go there and vote. I can´t believe any serious investor would give so much credit to these proposal. People is concerned that a whale with 12 million SMART of voting power is trying to steal from the community budget. I think @Solarminer, @mark-smartcash and @Zaphoid should pay attention to such whale-backed doubtful proposals from the newly added members not actually trying to response to the questions. SmartCash reputation hardly suffers when stealing from the budget is suspected. What do you particularly like about the project? Would you describe the project cost as a good investment? Do you have an expertise in mobile app development or marketing? Thank you for the kind words of support, RoMario. Thank you for taking an interest in Anypay’s proposal. I understand you are concerned that the price of integration seems high if the number of users is only 100+. Since Anypay is a web app, there are more users with accounts, but we count the number of active users as those who have processed a cryptocurrency payment within the last 90 days. We have over 100 verified merchants with retail locations with real addresses and picture proof of existence. According to our public charts at https://charts.anypay.global , you can see there are currently 133 active merchants, and that number is growing. I think this is a lot. Other point of sale services can point to lots of installs, but how much real world crypto commerce activity are they actually generating? Can they even tell you? We can, and the numbers show that it is increasing. We grow organically wherever there are communities of people who want to spend cryptocurrency. 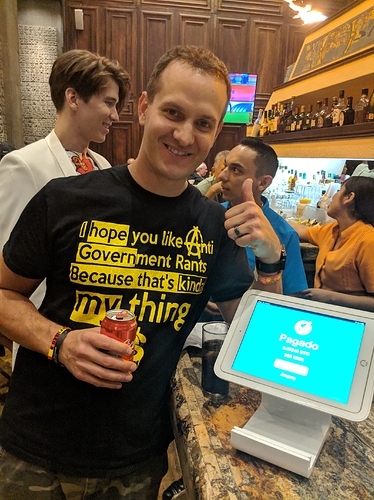 Right now we are in Anarchopulco and we brought an iPad with us – in one day, we were able to help the bar accept cryptocurrency for drinks and food. This is who we are. Crypto users who encourage real-life commerce and spending. We believe SmartCash is a perfect fit for Anypay because of our shared values. Let’s grow together as we inspire our friends and neighbors to use cryptocurrency as everyday money. I’ve visited Portsmouth NH and used Anypay to pay with other coins like Dash and Zcash. I can say without a doubt Anypay is a pleasure to use. The crypto community these guys built in Portsmouth is a perfect model for spreading crypto usage throughout the world. You can already see it developing in places like Caracas and Thailand. I’m excited SmartCash is now integrated and available as an option at businesses using Anypay. Thank you for funding this project!